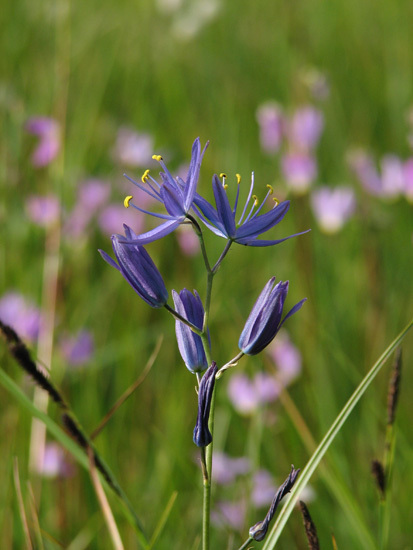 Camassia is a bulbous genus with species that grow in moist open habitats, often wet meadows. Most of the species are native to North America and four of them the Northwest. What family they belong in has been subject to revision. 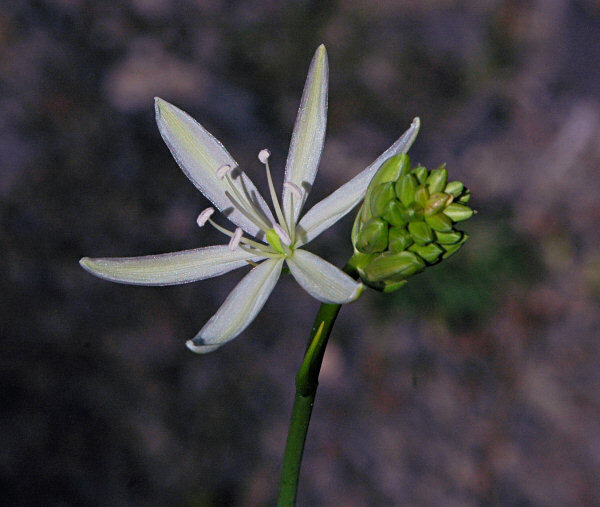 They have been considered in the Liliaceae family, the Hyacinthaceae family and lately with DNA studies have been assigned to Agavoideae subfamily of Asparagaceae. 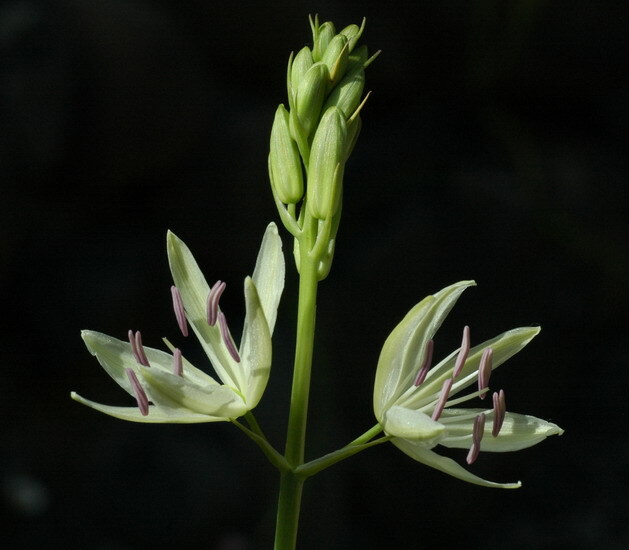 Camassia leichtlinii (Baker) S.Watson has two subspecies, the pale creamy-yellow type ssp. 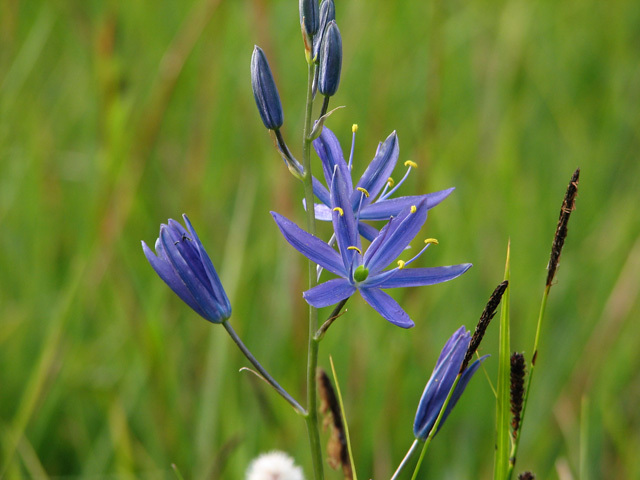 leichtlinii and the dark violet-blue ssp. suksdorfii. The type form (in the botanical sense) is in fact atypical in the everyday sense, having a narrow distribution around Roseburg, Oregon. 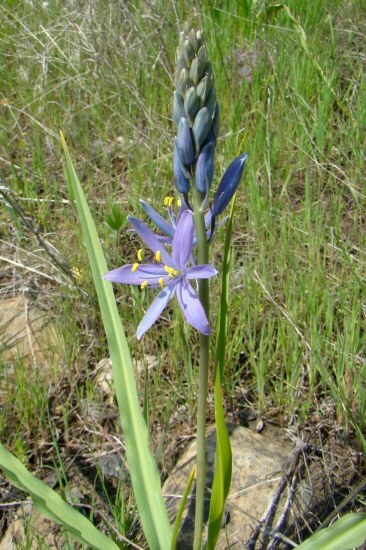 Camassia leichtlinii ssp. 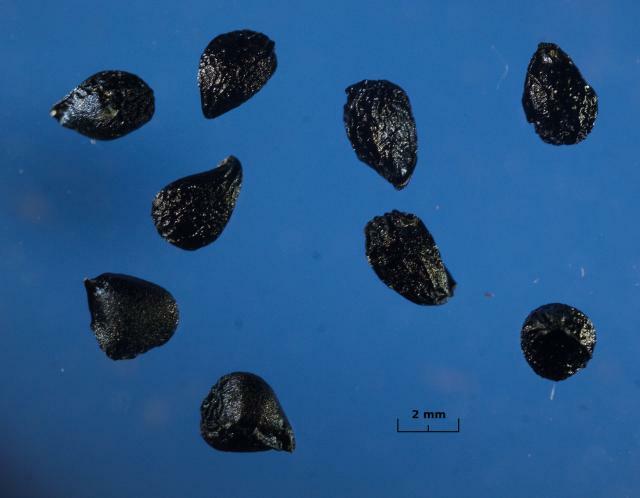 leichtlinii Photo 1 by Rodger Whitlock shows a seed-grown garden plant of ssp. leichtlinii. 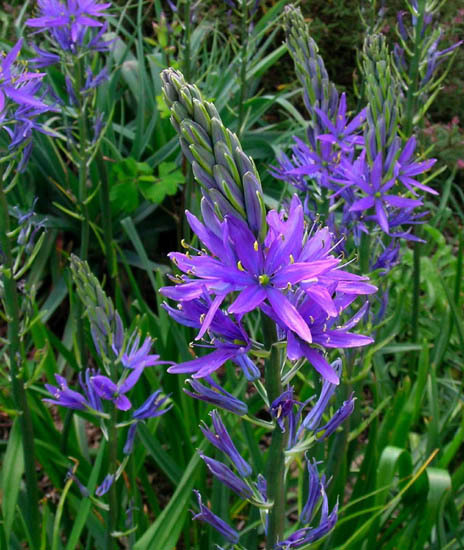 He notes:"Enthusiasts are warned that this form, like all other camassias I have dealt with, is a pest in a favorable climate, almost as bad as bluebells (Hyacinthoides non-scripta). 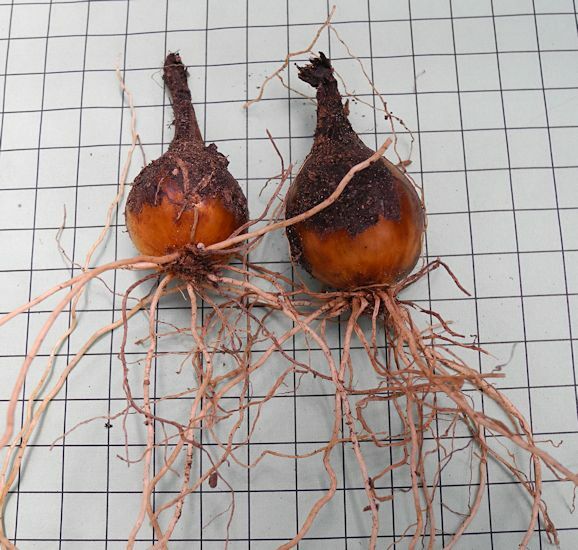 Every seed germinates and the bulbs bury themselves so deeply as to be very difficult to dig up. 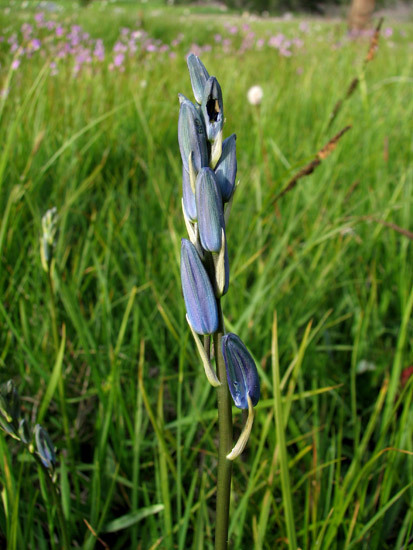 Fortunately, they do not form offsets, unlike the bluebells. Photos 2-5 were taken by Mary Sue Ittner of plants blooming in different years in different stages of bloom and the bulbs on a 1 cm grid. Photographs by David Pilling of seed and a seedling on a 10 mm grid, this seed was sown on the 15th January 2013 and kept outside (temperatures just above freezing), and is shown on the 29th April. 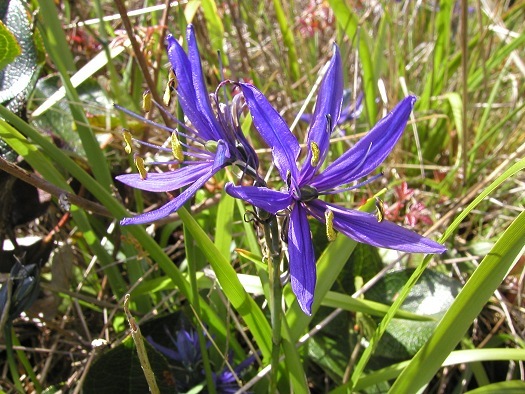 Camassia leichtlinii ssp. suksdorfii (Greenm.) Gould is widespread in coastal areas around the Puget Sound and Strait of Georgia. 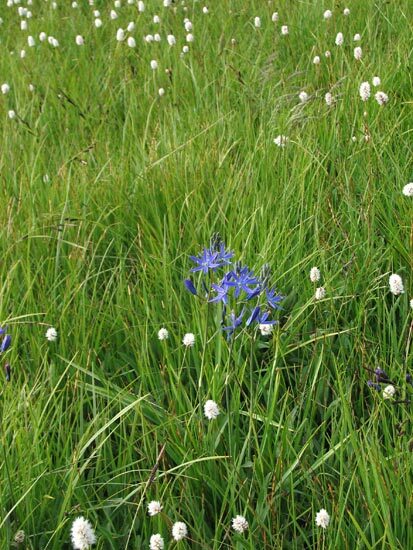 White (and pale blue) individuals of Camassia leichtlinii ssp. suksdorfii are not uncommon; they are clearly and easily distinguishable from the creamy-yellow ssp. 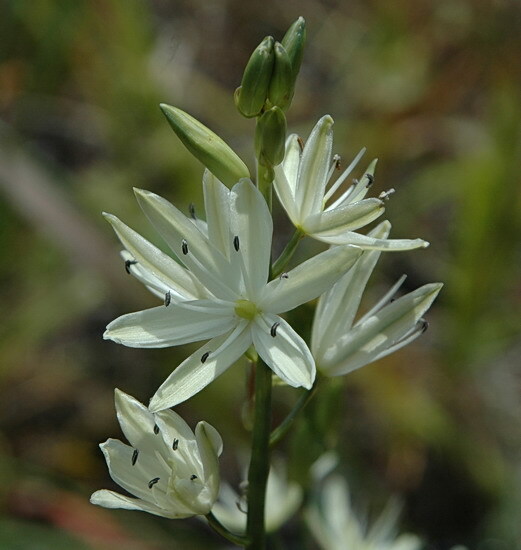 leichtlinii, which is often erroneously described as white. Photo 1 below is contributed by Kathleen Sayce; it probably belongs to this subspecies. 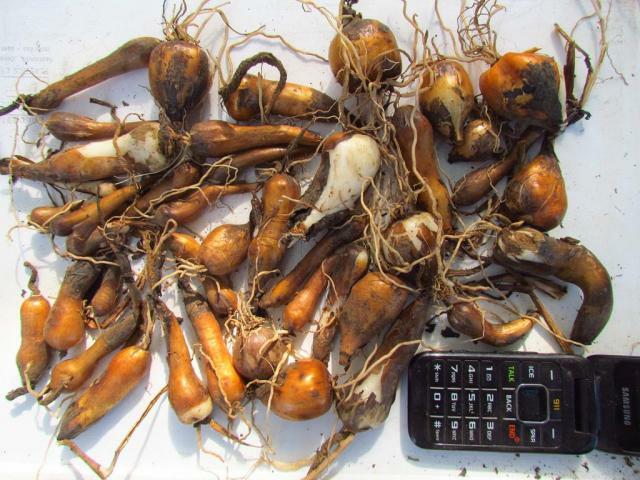 Photo 2 from Richard Haard shows bulbs. 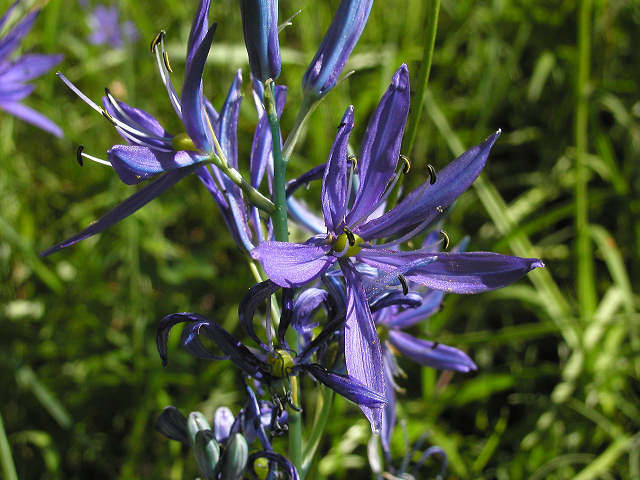 Camassia leichtlinii 'Semiplena' is sometimes seen under different variant names. 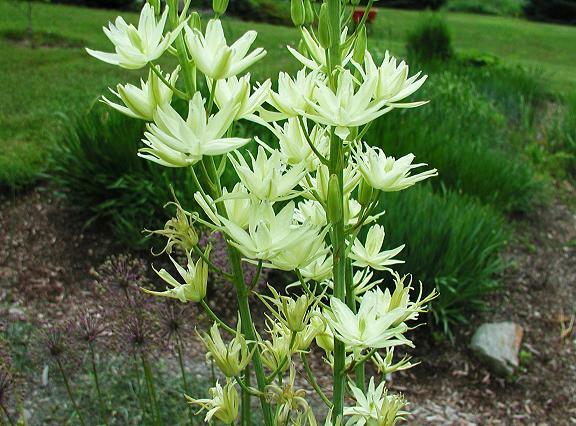 This semi-double form of this species is interesting for its tall spires of cream-colored flowers, nearly a pale yellow color. 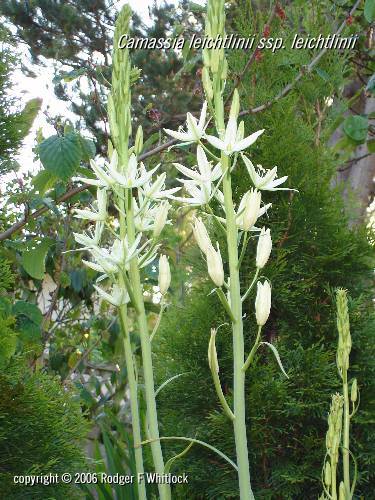 The flowers are on tall wands up to 4 ft (120 cm) and are rather fleeting, lasting only a day or two, then moving on up the stem. At it peak, at early anthesis, it's fairly attractive. Overall I think it's too tall, somewhat dull and inferior to the single flowered types, and no match for those with blue flowers. The plants go dry during anthesis, so need an underplanting of leafy perennials to conceal the drying growth. Photos by Mark McDonough. 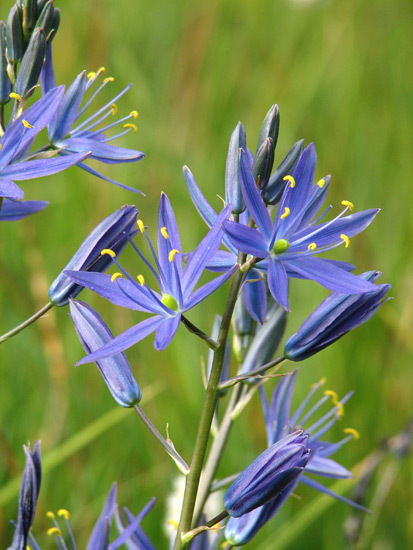 Camassia quamash (Pursh) Greene grows from British Columbia to northern California and inland to Montana, Wyoming, and Utah. The first two pictures show plants growing in a wet spot close to the ocean in Northern California. In the large patch all but one of the flowers were purple. In the midst was one white one. 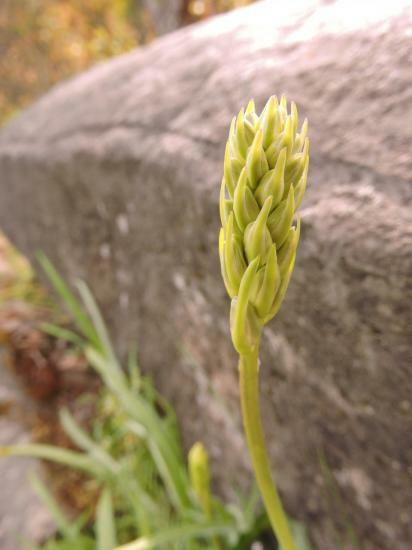 The second two pictures were taken on a ridge top location where they were flowering in mass in a very wet spot. Photos 1-2 were taken by Bob Rutemoeller and 3-4 by Mary Sue Ittner. Photo 5 was taken by Mary Hunter in Sonoma County, California. Photo 6 contributed by Kathleen Sayce probably represents a horticultural variety. 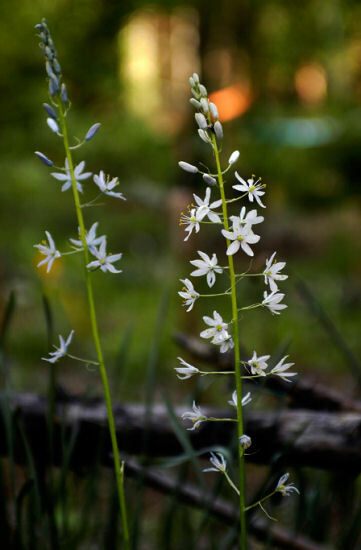 The photos below were taken in late June 2010 in situ by Nhu Nguyen in Yosemite National Park, California. 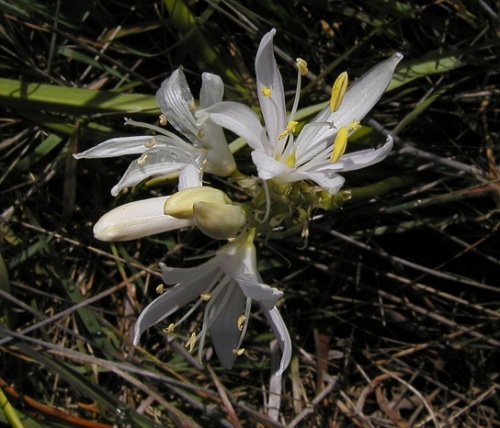 The plants were found in a wet meadow near Crane Flat at about 1900 m (6000 ft). This area is covered in snow in the winter. 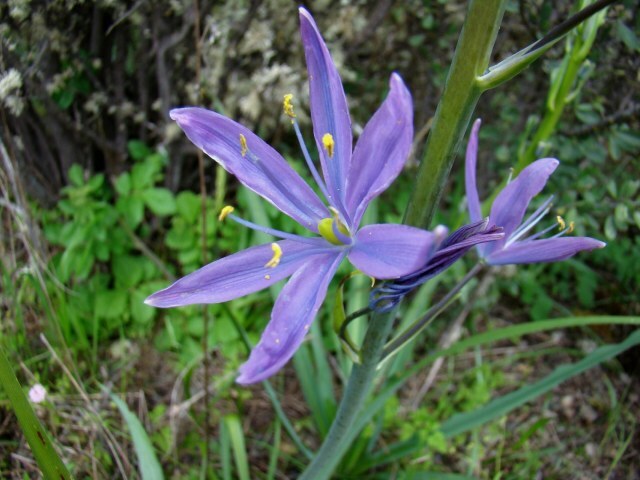 This photo shows a strain of Camassia quamash ssp. 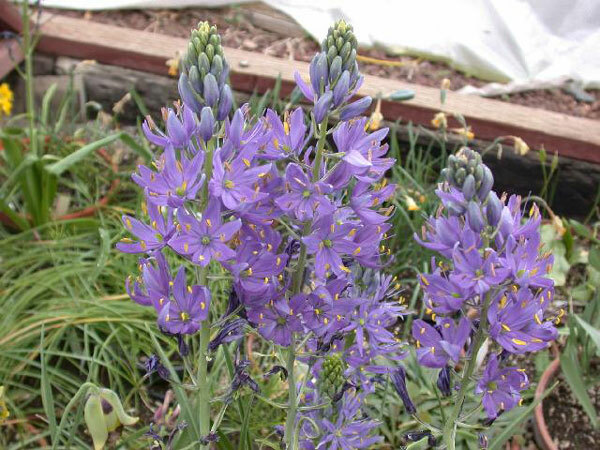 maxima, native to western Washington and Oregon; this very robust plant is grown by area gardeners under the name "Puget Blue," which is an informal designation, not a cultivar name. 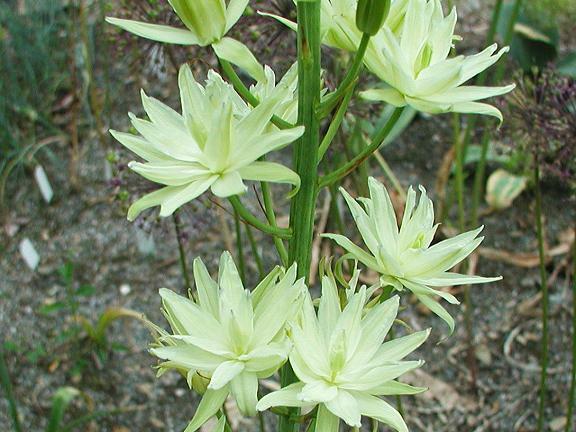 The flowers are about 1 in (2.5 cm) across, and the stems as much as 30 in (75 cm) tall. Photo by Jane McGary. 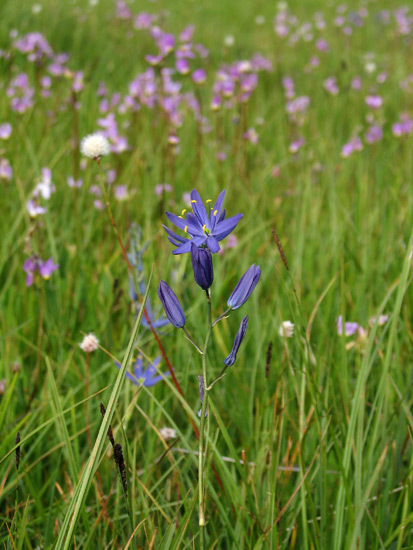 Camassia scilloides (Raf.) Cory grows in low meadows, prairies, seeps, and wet woods in the eastern United States. 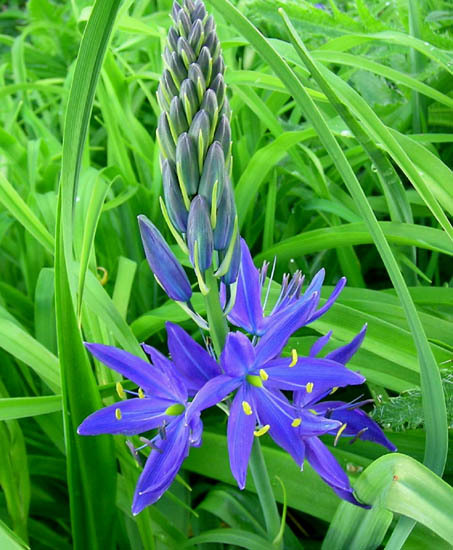 Common name: Wild hyacinth. Photo by Giorgio Pozzi May 2008. 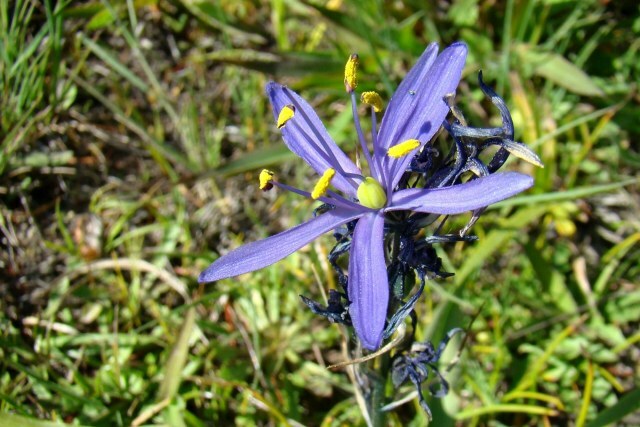 Camassia sp. 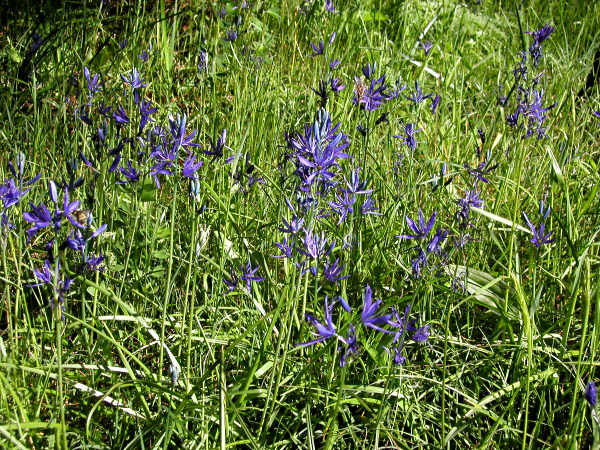 grows en masse on the bottom third of the Upper Table Rocks trail, flowering mid to late April. The first photo taken by Travis Owen. The next two taken April 2017 by Mary Hunter.